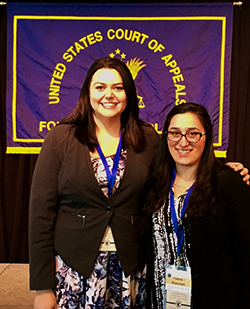 Third-year law students Polene Ghazarian and Camille Daley won scholarships to attend the Court of Appeals for Veterans Claims (CAVC) 13th Judicial Conference in Washington, D.C. The scholarships were given by the CAVC Bar Association to 10 law students from across the country, based on a written essay or community service in the field of veterans law. The CAVC conference attracts judges, lawyers and those interested in veterans law from across the country. The conference theme was “A New Generation of Veterans, A New Generation of Challenges.” The program addressed many of the challenging issues faced by veterans’ law practitioners as veterans of the current conflict pursue claims for benefits from the Veterans Administration. The program focused on the changing landscape of veterans law. At the conference, the students were able to interact with a number of College of Law alumni, including R. Charles DiNunzio L’15, Sharmine Persaud L’89 and Emily Purcell L’09.